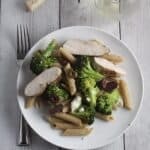 Penne with Grilled Chicken Broccoli and Garlic is a tasty tweak of the classic Italian recipe. Cut the root end off the head of garlic, exposing the bottom of the garlic cloves. Drizzle exposed cloves with 1 tablespoon of the olive oil. Season with salt and pepper to taste. Wrap the garlic in aluminum foil, then put on the grill, on indirect heat. Roast until garlic is brown and getting very soft, 30-45 minutes. Set aside to cool when done roasting. When the garlic is cool enough, squeeze out the roasted garlic into a small bowl. Add 1 teaspoon olive oil to the garlic, and stir to combine a paste. Set aside. Meanwhile, as the garlic roasts, combine the chicken in a bowl with the olive oil, garlic powder, basil and salt. Let it marinate for a bit, as the chicken will only take about 10 minutes to cook. This is a good time to start the water boiling for the penne. Steam the broccoli: put an inch or two of water in a large pan. Insert a vegetable steamer into the pan and add the broccoli. Steam for 4 to 5 minutes. Move the steamed broccoli into a bowl, and combine with the 1/2 teaspoon garlic powder, 2 tablespoons olive oil, parmesan cheese, salt to taste, and red pepper flakes. Stir the broccoli is well-coated. Transfer the broccoli to a grill pan, and place on the grill. Start grilling the chicken and cooking the penne around the same time you put the broccoli on the grill. Coat the grill with oil spray, and place the chicken on the grill. Grill the chicken for about 6 minutes on one side, then turn over to finish grilling for another 6 minutes or so. Check the chicken for doneness after 12 minutes of total grilling. Remove chicken if done, or grill for a few more minutes to finish cooking if needed. When the chicken has cool, slice the chicken into bite sized pieces. Stir the broccoli after it has been grilling for 5 or 6 minutes. Grill for another 6 minutes. The broccoli should be starting to brown and caramelize. Remove from heat. Cook the penne according to package instructions as you grill the chicken and broccoli. When the pasta is cooked, drain and toss with 3 tablespoons of olive oil, 1 tablespoon of white wine, the feta cheese and sliced olives. Stir in the roasted garlic paste. Add the chicken pieces and broccoli to the pasta. Stir to combine well. Plate and serve with additional parmesan cheese at the table. Enjoy!